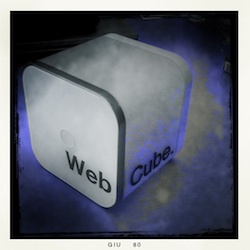 The 3 Web Cube was the last product developed by my team before I left H3G to join frog design. I think it is one of the best product we ever designed, even if it had a troubled birth, somehow. From a technical point of view it is nothing else that a MiFi device; a WiFi/UMTS router for domestic use. The original idea was very simple. Let’s take an existing MiFi architecture, redesign it for domestic use, and simplify the end user User Experience. Sounds easy, isn’t it. Well, it wasn’t. Design wise it’s made of two different pieces. The first piece is the device itself. It can be plugged in a wall outlet and it will starts its operations automatically. The second piece is a cradle where you can plug in the main device in order to place it on a desk or on any flat surface. Design was an interesting exercise. We analyzed all of the MiFi devices and UMTS/WiFi routers out there and we dissected them from an hardware point of view. What are the functions of all the LEDs? How do you power the device? What visual indications are given to the user? How does the device communicates its status to the client? The same process happened on the software side. How do you configure the device? How do you connect to the 3G network? How is the connection managed? How do you configure your WiFi connection? We found that most products were complex, unfriendly and ugly. Well, most of them. Our goal was to have a simple, simple, simple device. The next step was to strip out everything. He wants to know how strong the 3G signal is. He wants to know the status of the device. This is why the device has just one visual signal indicator in the front showing the strength of the 3G signal and a set of blues LEDs in the back to visually represent the status of the device. We wanted our client not to be scared about the device and the configuration. If you look at the main device it’s a very simple one. It has a plug on the back, one button in the front and that’s it. When the client will take it out of the box the very first thing that he will see is the wall plug. The only thing he can do is to plug the device. Nothing else. Then some magic happens. The device turns on automatically, connect to the 3G network and powers up the WiFi interface. In less than fifteen seconds the device is up and running. Now you are ready to connect to the Internet. Just look at the quick user guide and type the WiFi password on your personal computer and your connected. Three simple steps compared to a much difficult path with other devices. We have seen other products with huge user manuals and CDs in the packaging. We did not want this. The packaging is very simple. You have the main device, the cradle and just one leaflet with the quick user guide. That’s it. The quick user guide has been designed to be visual in order to show to client what he has to do to connect to the Internet in three single steps. My team has worked really hard on this product, and it is not perfect. What’s the reason? Any product, or service, you design has to cope with existing processes in your company and we had to go through so many hurdles with this. We come down to compromises that somehow made the product less friendly compared to what we originally designed. Well, you know. That’s how it works. Nevertheless it is something I am really proud of. Thank you to all of my ex-team who has worked on this and to all of the colleagues that made this happen: Adam, Sergio, Lavinia, Mauro, Marco, Oronzo, Francesco, Marco, Marlene and so many others. We wanted to create magic, and now I still do! frog design Is My New Home!